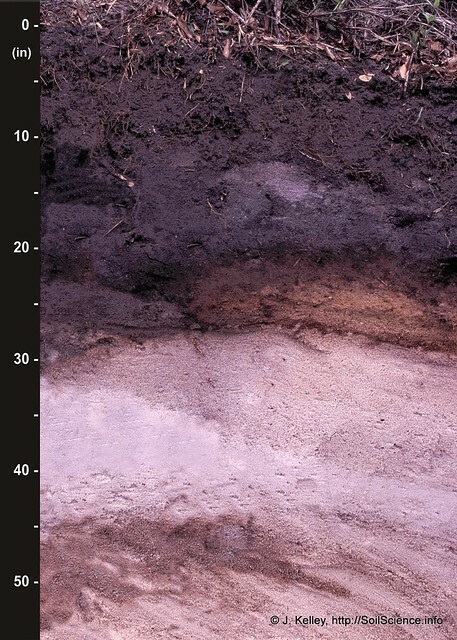 This is the third of a series of blog posts where I will describe some of the interesting features of each of the 12 soil orders in Soil Taxonomy – the soil classification system developed for the US by the United States Department of Agriculture. Each order will be “profiled” (forgive the bad soils pun) in the order in which they are “keyed out” in Keys to Taxonomy. The Spodosols soil order of Soils Taxonomy is a very interesting group of soils. Spodosols include many of the “Podzols” in other classification systems which was derived from the Russian “pod“, meaning “beneath”, and “zol” meaning “ashy”, i.e. “ashy underneath” in reference to the very light-colored E horizons of these soils (Buol, et al., 2003). Spodosols are most common in areas with coniferous trees as the primary native vegetation, and where the soil is coarse-textured. The driving force in the development of Spodosols is the translocation of iron (Fe), aluminum (Al), and organic matter. The needles of coniferous trees are very acidic. As they fall to the ground and decompose, organic acids percolate through the soil profile (with the movement of rain water). These organic acids strip off Fe and Al from the soil particles in the A and E horizons. These metals and organic acids are then deposited in the B horizon, just below the E horizons, in layers that appear to be yellow or brown (like coffee grounds) to red in color. The presence of a spodic horizon is confirmed chemically in a laboratory (by determining how much extractable Fe and Al is present). Spodic horizons tend to be yellow to red in color. In the case where large amounts of organic matter has accumulated, the horizon may be dark brown or almost black in color. Spodosols are split into four suborders. Aquods are Spodosols that are very wet. They often have very grey subsoil colors (except for the Bs or Bhs horizons) with very dark colored A horizons. This is because saturation of the soil prevents the decomposition of the A horizon organic matter. Thus, organic matter accumulates and the A horizon gets really dark in color. Cryods are Spodosols that have evidence of freeze-thaw. Humods are Spodosols that have large amounts of organic matter accumulating in the subsoil (such as in a dark-colored Bhs horizon, h for humic material). Lastly, Orthods are all other Spodosols. According to Buol (2003), Spodosols are used for forestry, pasture, hay, and cultivated crops. 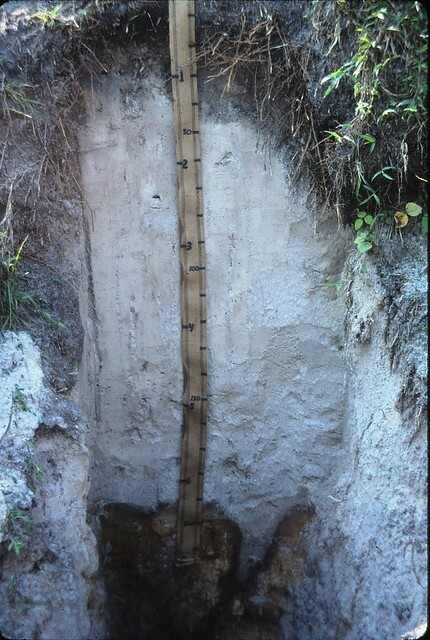 These soils are acidic in nature, and require large amounts of lime to neutralize the effect that Al has on roots (Al limits cell growth in the tips of roots). Because these soils are highly weathered, due to the organic acids, few minerals are present naturally. Thus, fertilize must be applied for agricultural use of these soils. Spodosols are some of my favorite soils, partly because they are so beautiful and unique, and partly because my dissertation research involves the Leon sand (see picture above). This entry was posted in Lessons in Soil Science, Soil Orders, Spodosols, Terminology and tagged Aquods, Cryods, Humic, Humods, Orthods, soil, Soil Taxonomy, Spodic, Spodosols. Bookmark the permalink. Hi there! Are you an active online visitor or you are for offline ways of communication? I’m online frequently. I usually only check my blogs when I’m writing new posts though. The “resources to dig” page will have links to where you can contact me. Twitter or Google+ are best. If you have specific questions, I’d be happy to answer them. If you want me to do your homework for you, then no. My name is José, I from Brazil and I would ask you about possibility of use Ground Penetrating Radar to study the depth os Bs or Bhs horizon of Spodossols. What would you like to know? I don’t have personal experience with GPR, but I would assume it would work. If you have a particular question, I might be able to direct you to someone with more expertise in that area.